Not long ago, true HD camcorders were few and far between. Now, there are so many options it’s hard to pick. The Canon VIXIA HF G30 is a promising option that brought some innovations to the scene when it first arrived. If you’re sick of unreliable entry to mid-level camcorders but gasp at the prices of proper professional gear, you’ll be happy about the middle ground where the Canon VIXIA HF G30 resides. 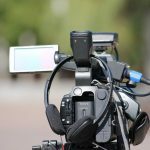 The step up from beginner equipment is a significant step on every videographer’s journey. 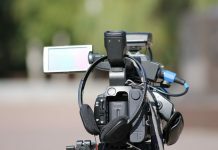 You're ready, now you just need to decide if this camcorder is exactly right for you. Once the crown of Canon’s Vixia series, this HD camcorder still stands strong. 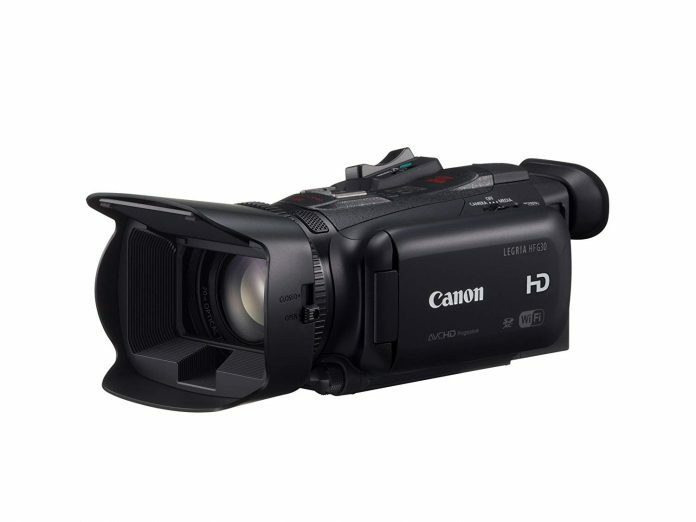 The Canon VIXIA HF G30 has many quality-boosting features. For example, the Canon 20x HD lens and its 8-blade circular aperture provide excellent video quality with pleasing, natural background blur. It has WiFi-connectivity for fast video transfers and remote controlling. The viewfinder is effective, easy to use, and functions up to 45 degrees of tilt. You can adjust it with a joystick while recording with one hand. An HD Video lens with an effective hood and a minimum distance of 23.6 inches provides good footage. It uses aspherical lens technology for low chromatic aberration and high resolution despite the small size. It’s also coated to prevent flares and ghosting. 20x optical zoom is great for a camera of this quality. The Dynamic SuperRange optical image stabilizer keeps your footage free from blur as you zoom. You can also focus manually with the focus ring. The Canon VIXIA HF G30 has all the manual controls you can expect. Add to this an excellent touchscreen. With a 1,230,000 dot resolution and accurate colors, it lets you know what you’re doing. It has indicators for battery level, recording time left, your framerate and bitrate, whether or not you’re in auto mode, and more. While it’s somewhat bulky, it’s not hard to operate with one hand for a while. The hand strap provides the comfort needed. There’s a taper for comfortable gripping, and your index finger lands on the zoom rocker. You get a big record button on the back, alongside a function button and a control joystick. On top, there’s a switch for toggling between recording and playback. Next to it, there’s a toggle for manual, auto, and cinema mode. The last one applies special effect filters. You also find two accessory shoes next to them. One regular shoe and one Canon Advanced Mini Shoe. 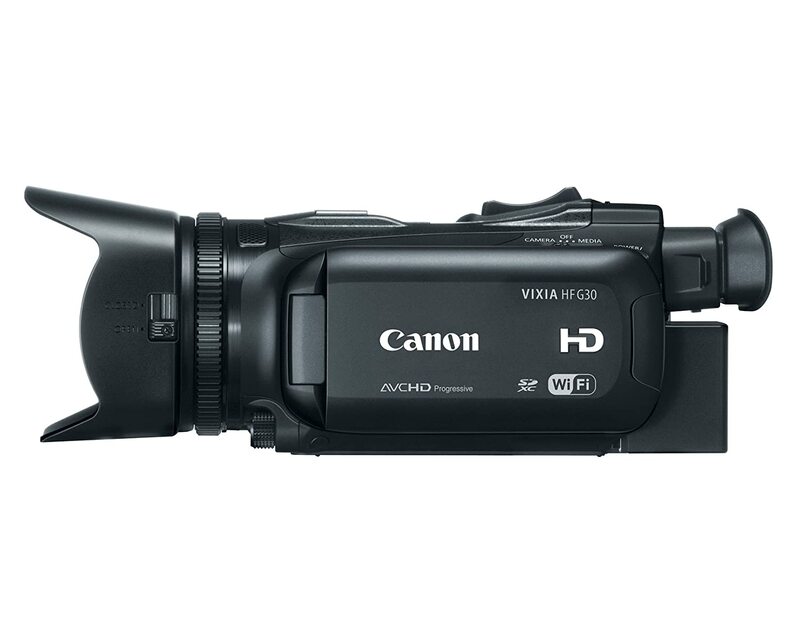 The Canon VIXIA HF G30 can shoot full HD at 60fps. It can also record 35-MB/s MP4 files. Its combination of a DIGIC DV 4 image processor and 2.91-MP HD CMOS Pro sensor produces excellent image quality with significantly reduced noise. 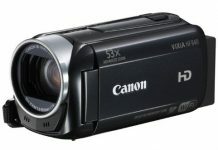 What we really like about HD camcorders like the Canon VIXIA HF G30 is the Dual Recording function. It lets you record both AVCHD and MP4 at once. Or you can use Relay Recording, so the two memory cards act as one storage for continuous recording. Despite the lack of internal memory, you can store around four hours of high-quality footage if you fill the card slots. The Canon VIXIA HF G30 won’t disappoint. You get lots of detail and texture with natural depth. Colors are very accurate, and it retains details in bright spots. There’s a little bit of noise, but not something you notice under normal conditions. You may encounter some mosquito noise or chroma noise in high-contrast areas. It becomes more noticeable indoors, but the Canon VIXIA HF G30 handles well in the dark in general. There are noise and diminishing colors, but compared to a typical camcorder it’s great. You won’t get a lot of compression effects. Even as you go down to 17Mbit/s AVCHD format, the compression isn’t evident. Users like the Canon VIXIA HF G30 for its convenient design, good footage, and responsive auto features. What they miss are infrared footage and a separate battery charger. Thus, they give it 4.5 stars on average. The Canon VIXIA HF G30 is a discontinued product, so most vendors don’t carry it. If you find new ones, they cost between $1,500 and $1,700. You can get used ones for half as much. Check it out here. 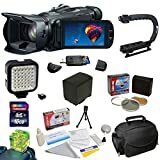 The quality of a product is always relative, so let’s compare the Canon VIXIA HF G30 to a few competitors. We’ve chosen the Sony FDR-AX53, JVC GY-HM150U, and Panasonic HC-W850. The reviews presented in this article are the result of analyzing and comparing many user experiences and comments from the web. Our primary source is Amazon user reviews. Here’s one of Sony’s first 4K camcorders. If you have a 4K screen, or you’re planning to get one, you may want to consider this higher-resolution option. Many consider it overkill for consumers, but it’s a matter of taste. It’s smaller and lighter than the Canon VIXIA HF G30. The ZEISS Vario-Sonnar T lens offers 26.8mm wide-angle footage. This is comparable to the Canon VIXIA HF G30. The Clear Image Zoom extends the 20x optical zoom to 40x in HD mode using digital assistance without pixelating the recording. It only goes to 30x in 4K mode though. 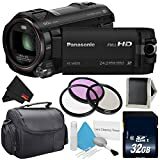 Its image stabilization is a bit more elaborate than that of the Canon VIXIA HF G30, with a 5-axis Intelligent Active mode for vibration reduction. This doesn’t work for 4K video though. It is capable of 4K time-lapse footage, while 120fps slow motion is only for HD. A 5.1-channel microphone is another advantage. Despite its fancy features and high resolution, it’s not a professional-grade camcorder but a “prosumer” product like the Canon VIXIA HF G30. It does have plenty of advanced features though, like WiFi, NFC, livestreaming, and multi-camera control. The latter lets you synchronize and control several Sony Handycams from this one. A smart multi-purpose ring makes controlling the zoom, exposure, focus, and shutter speed quick and easy. You change which function it affects with a dedicated button. NFC makes connecting a smartphone an effortless task. You can use this phone as a viewfinder and more with the PlayMemories app. In addition to 1080p and 4K it and produce super-sampled HD video. This involves a process of downsampling a 4K video to full HD. The final result is better than ordinary HD video. In 4K mode, you may get some blocky compression artifacts when there’s a lot going on. This camcorder performs well in poor lighting conditions. 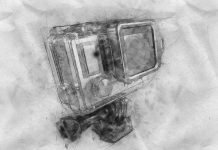 Footage remains clear and detailed until you reach dark conditions. You get a night-vision mode in case you want to shoot in absolute darkness. Users like the image quality and stabilization. Some users find the manual mode inconvenient, and others report rare visual glitches in 4k mode. This lands it at a four-star average. 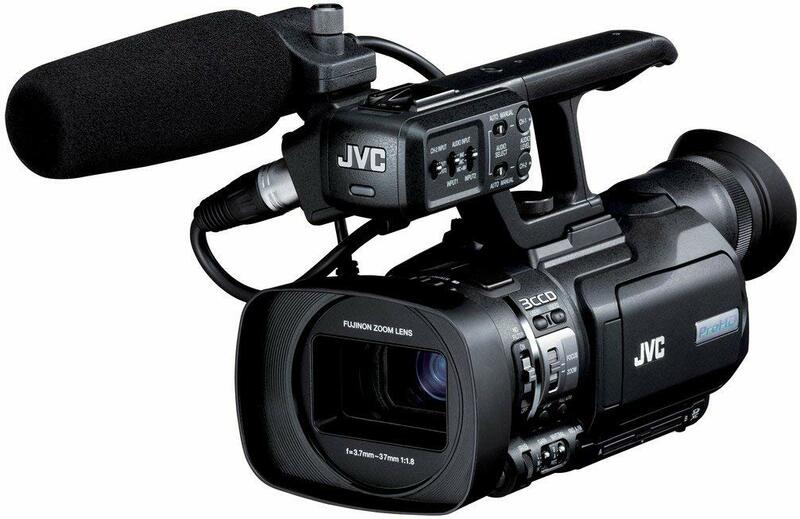 JVC’s GY-HM150UC compact triple-CCD camcorder captures 35MB/s long-GOP MPEG-2 video at 1080p in a variety of modes. Don’t be fooled by the tiny size; this is a powerful “prosumer” camcorder. A high-definition Fujinon 10x lens with three aspheric elements provides excellent fidelity with less space. It keeps distortion, flares, and ghosting to a minimum. The 3.7-37mm focal length grants a nice balance of zoom and wide-angle footage, and the optional wide-angle converter takes this further. You can zoom with a rocker or directly on the lens. The macro mode works as close as two inches from the subject. You can set focus and iris to automatic or manual. You’ll see the current F stop on the viewfinder. It provides all popular HD resolutions and 720p. The progressive CCD setup and five digital noise-reduction technologies ensure a responsive, high-quality result with minimal degradation. The native format is .mov (QuickTime,) which is very convenient for Apple users. You also have MP4 and AVI options for other systems, but no AVCHD. You can choose to record to each memory card in sequence or both at once. The latter option is great for backing up footage, providing a client copy, or letting two editors work in tandem. You can hot-swap cards for long days of continuous shooting. This function also lets you edit fresh footage while the camcorder keeps recording. You can also select cards manually for scene-by-scene separation. And you can pause recording on one card without pausing the other. There are also options to cut and join videos on the camcorder. By shifting the blue and red pixels relative to the greens, you get better luminance information and higher resolution without any loss of sensitivity. The global shutter reduces low-light noise and pan wobbling. Together with the degradation-free rotary optical image stabilizer, this leads to smooth, consistent footage. It struggles in low-light conditions though. A pre-record function lets you salvage events that happened a few seconds before you hit the record button. You also get a time-lapse mode. Users like the convenient size and the quality of video and audio. Some don’t like the green offset, and some users report dead pixel issues. They give it a 3.7-star average. This one differs from the Canon VIXIA HF G30 in significant ways. They call it a twin camera because it can record from two sources. There’s a secondary camera on the pop-out display panel. This innovation can spin in place so that you can record your face or something off to the side. It records a separate video stream and superimposes it as a smaller window onto the main footage in the corner of your choice. However, you can’t save it as a separate file, so it’s a limited feature. One nice way to use it is to keep a wide-angle view while zooming the main camera. The HC-W850 uses one dial for most manual settings, which you set to whatever aspect you want to adjust. You can also use a smartphone app to view and control things via WiFi. You can also live stream to Ustream or upload to social media straight from the camcorder. It doubles as a baby monitor, and you can speak into your phone and have it come out of the camcorder. It has infrared functionality, a noise shield, and a 50MB/s bitrate for MP4 files. The primary sensor is a back-lit 12.76-megapixel CMOS, and the secondary camera uses a 1/4-inch 5.27-megapixel sensor. Its rotating lens has the primary purpose of letting you record your reactions or narration of the main footage. You can choose between a big or a small window for the secondary camera’s footage. If you want to turn it off, make it face the display. This secondary camera has no stabilization or zoom and only fixed focus. In addition to the standard manual controls and auto mode, you get intelligent auto and various scene modes. These settings only apply to the primary camera in most cases. MP4 footage is solid with good motion, although the camcorder lacks a 24p mode. The HC-W850 handles low light pretty well. But in darkness, color accuracy goes bad. Speaking of accuracy, the touchscreen isn’t the most accurate. Some may find the touch buttons a bit small and unresponsive too. Users like the price point, smartphone connectivity, and special features. What they don’t like is the relative bounciness when zoomed in far and how close the second camera is to the face. Overall, they give it 4.3 stars. With all that technical data covered, it’s time for a summary. Here are the best and worst aspects of the Canon VIXIA HF G30. 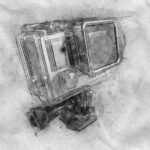 With its many advanced features and solid HD quality, this is a viable option for all serious hobbyists and semi-professionals. If you’re not looking for the newest option, this tried-and-true classic will serve you well. If you’re looking for a cheap or compact option, this isn’t it. In that case, you’ll prefer the Sony or JVC. Otherwise, the robust high-definition Canon VIXIA HF G30 is an excellent choice. The Canon VIXIA HF G30 was an impressive camcorder when it first arrived, and it still holds up well years later. While not a compact camcorder, it’s lightweight enough for one-handed use. Clear 1080p 60p video with responsive settings and a reliable viewfinder make it easy to shoot with. WiFi and clever use of dual memory cards keep it future-proof. Overall, Canon VIXIA HF G30 is a formidable camcorder and deserves 4.5 stars. If you’ve decided on the VIXIA, you can find a good deal here. The Canon VIXIA HF G30 has a advanced dual SD functionality Wi-Fi and remote control. However If you’re looking for a cheap or compact option, this isn’t it. Previous articleCanon VIXIA HF R40 Review: Is It Still Relevant?